Freaky Kentucky Caves are Longest in U.S.
Summer Travel: Freaky Kentucky Caves are Longest in U.S.
(Mammoth Cave National Park, Kentucky) - This summer, escape the summer heat and head underground to explore the country’s longest cave system. At Mammoth Cave National Park there’s an adventure for everyone in the family. 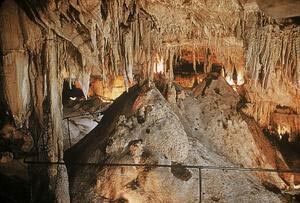 Mom and Dad can take in some history and romance exploring the caves by lantern light. Thrill-seeking kids, ages 8-12, can try out the Trog trip, an adventurous kids-only headlamp-lit jaunt into the caves. The young at heart may prefer Intro to Caving or the self-guided Mammoth Discovery Tour. For post-caving rest check out Mammoth Cave Hotel, the only hotel located in the park. Lodgings include rooms in the Heritage Trail Lodge, rustic cottages and sunset terrace rooms at the forest’s edge. Larger families will love the Woodland Cottages which can hold up to 16 guests. Hospitable hotel staff are happy to direct guests to the park’s visitors center and other area features. Parents need not worry about long car rides and lines for food with 3 restaurants nearby on the property, ranging from coffee shop style to sit down dining. After touring the natural beauty and wonders of the caves, families can enjoy discovering what lies above ground: over 30 miles of meandering rivers and 70 miles of trails for hiking, biking and horseback riding. Everyone can head out in a canoe or relax aboard one of the nation’s few remaining rural ferries. Mammoth Cave Hotel provides comfortable year-round accommodations and convenient access to the historic entrance to the world famous Mammoth Cave and the Mammoth Cave National Park Visitor Center.